We have a new yarn in our clearance section. This is the remainder of a special order, and a wonderful opportunity to try something new. We usually do not stock acrylic yarns, but a customer was looking for something easy care for a baby blanket and sweater. 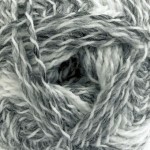 Of course, we obliged, and found one of the nicest acrylic yarns on the market, Marble. Marble, by James C Brett, is a beautiful multicolored DK weight yarn. This yarn has two piles of different shades spun together. The knitted fabric will have unique bands of striped colors. (click for larger view)Marble is very soft, and machine washable. It comes in 100 gram skeins that have a generous 240 yards. I have knit scarves for my nephews with Marble, and they love the scarves. No complaints of itchiness, and the scarves look great after several washes. The yarn normally sells for $7.00 per skein, and is on sale for $5.25 per skein. You can find Marble in our clearance section. Remember to use the coupon code: “clear20” to receive an additional 20% off your order of $50.00 or more of clearance items. Take 20% Off Everything in our Clearance Department! Plus, 20% off books, magazines, patterns, and other Select Products! A $50.00 minimum order (excluding tax and shipping charges) of clearance and/or the above products is required. The sale ends on September 30th at midnight Pacific time. All coupon sales are final. Up to 60% Off in Clearance Section, with coupon! 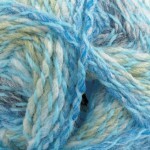 Visit our clearance section to see all reduced yarns and magazines. Make sure to also check our regular store areas, as there are many sales and reduced items that are not in the clearance section. You will find savings throughout our store!